Will Las Vegas Overtake Macau for the Global Gambling Crown? As the calendar turned over to a new month, revenue reports for Asia’s premier gambling destination highlighted the region’s recent economic decline. August marked the Macau casino market’s 15th consecutive monthly decline, and the freefall has shown little signs of correcting itself any time soon. According to results reported Tuesday by Macau’s Gaming Inspection and Coordination Bureau, the market’s 36 casinos collected approximately $2.3 billion from gamblers last month. While this may sound like a lot of cash, it represents a drop of more than 35 percent from the same period of 2014. Adding to the misery, these results marked Macau’s seventh straight decline of more than 30 percent, including a record drop of 49 percent in February. Despite the results, casino executives aren’t proclaiming that the sky is falling quite yet. Instead, they are enjoying a small victory in the fact that August results slightly outperformed analysts’ predictions. Even with the optimism, Macau’s recent results are most definitely a cause for concern. In the first eight months of the year, cumulative gaming revenue fell by 36.5 percent, as compared to the previous year. This decline is added atop the disappointing 2014 results, which recorded the market’s first-ever annual drop. The region topped out in 2013 as the world’s largest gaming market, producing a record $45.2 billion in gaming totals for the year. For now, however, officials are scrambling to correct the current freefall. Much of the downturn is being attributed to increased pressure originating in Beijing. The Chinese government’s increasingly strict anti-corruption campaigns have many Chinese visitors wary of visiting the country’s special administrative region, as illustrated by the 6.1 percent drop in mainland visitors during the month of July. As a result, many in the casino industry are left hoping for a break in the anti-corruption campaigns, but experts insist that it won’t be occurring anytime soon. Poor performance isn’t stopping the rapid expansion of the Macau gambling scene, however, as four new casinos are currently scheduled to open by the end of 2016. The 1,600-room Macau Studio City Hotel-Casino, which is being built by Melco-Crown, is the first on this list, with an expected open date in late October. 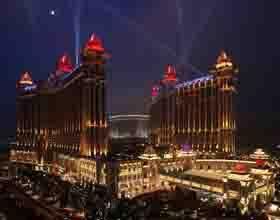 Las Vegas giants Las Vegas Sands, Wynn Resorts and MGM Resorts International round out the list of investors hoping for a positive turn in Macau’s gaming revenue in the months to come. Although it continues to struggle, Macau has a long way to go before it will be challenged for the global gambling crown. To put things into perspective, consider that a solid year for Las Vegas would result in approximately $6.5 billion in revenue, or approximately 15 percent of Macau’s 2014 totals. For the time being, Macau has cemented its position as the undisputed heavyweight champion of the gambling industry. With new casinos on the horizon, China’s casino hub will look to recover from recent results by attracting more tourists away from new gambling destinations such as Singapore and South Korea. The success of these efforts will likely depend on the actions of Beijing moving forward.